In an earlier article we looked at the potential problem with water wicking, or water migration, up the walls of tile showers with traditionally built mud/liner/mud “pans” or receptors. Along those same lines I wanted to test the difference in the likelihood and extent of such wicking among some of the more common materials used for the construction of such tile shower walls, such as CBUs, Fiber/Cement boards, and other backing materials specified for the application in one form or another. The test materials were chosen for variety and their availability in local home center outlets, those that would be commonly available to the retail buyer. 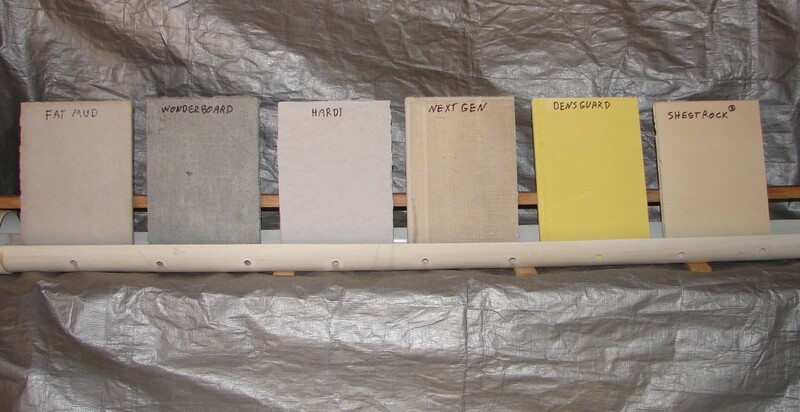 The only exception being the wall mud sample, which is unlikely to be used by the casual shower builder, but which has been the benchmark for shower construction for decades, and even that was made from pre-bagged material similarly available. We also included a sample of Sheetrock® as an example of why gypsum boards are no longer recommended for use in wet areas. To test the wicking action of the various types of backing material, we constructed a test mockup with a trough that could be filled to a consistent depth of about 3/4 in. with water. Holes in the side of the trough keep the water from going above the design level, allowing it to cover each of the samples to the same depth. The test mockup was in a covered, but not conditioned, space, and the testing was monitored for a period of one month with the trough being continuously filled with water during that period. Dark lines were drawn on each sample at the end of the test period to make the maximum wicking level of each sample more visible in the photo. You can see that there are significant differences in the wicking action in the different types of backer board. There is no line on the Sheetrock as it was completely saturated after the first week of the test as evidenced by the darker color. The wall mud or “fat mud” sample was made with an off-the-shelf mortar mix readily available in the home center outlets. It was made a half-inch thick to approximate the same physical characteristics as the other boards and contains the usual 2.5lb. metal lath reinforcement used in such construction. As you can see, the fat mud sample wicked almost no water during the test period, a result I found rather surprising. The gypsum-based tile backer board we tested was Georgia Pacific’s DensShield, which is advertised as having a “moisture resistant core” with “fiberglass mats and a unique heat-cured acrylic coating.” We knew any wicking that occurred would not be visible on the side with the acrylic coating, so the test was conducted with the yellow fiberglass mat side visible. It is labeled in the photos as DensGuard as that’s the name the product is sold under in Lowe’s stores in my area. Georgia Pacific verified that it is the same product as DensShield. You see no black line on it in the photos because it did not wick any measurable amount of water in our test. Some of the other samples were the same materials used in the first wicking test we did and the results were, of course, the same this time around. This time, though, we can see a side by side comparison of the results. And we don’t want any misunderstanding of the results of this testing. Some of the products are specifically not recommended by their manufacturer to be subjected to such conditions as in our test. It is not a failure, for example, for the Sheetrock not to hold up under these conditions as it’s not meant for such use and the manufacturer will be the first to tell you so. It was included in this test for comparison and perhaps to emphasize just why it’s not recommended for such exposure. Similarly, the manufacturer of the DensShield, like the manufacturer of Hardibacker, will tell you not to embed the product in the final deck mud of a traditionally constructed tiled shower receptor. Again, this project was for comparison testing of moisture migration, wicking, and not as a recommendation for or against any product for any particular use. We’re not creating any new science here, nor selling any products, we’re satisfying some curiosity. Mostly mine. Next we’ll try some tests to see how readily water will soak into the surface of each of these materials. Stay tuned.